The BCGB light pink dress from her New York City life at an event that commemorated the 100th anniversary of Marie Curie's Nobel Prize in December 2011. The sleeveless white Oscar de la Renta dress from Victoriadagen 2009. The gray Amanda Wakeley gown at the World Childhood Foundation Charity Ball in London in June 2010. The outfit worn when Princess Madeleine and Chris O'Neill took Princess Leonore to visit her duchy of Gotland for the first time in June 2016. She wore a Joseph top, white Moncler jacket, Tabitha Simmons decorated sneakers and sunglasses by Valentino. She also, at one point, was in wedges by Vince and carried a small Chloe bag. Her blue spotted dress by Somerset by Alice Temperley and her heart-shaped bangle from Krista Kretzschmar from her visit to a Folk Music Mas at Hedvig Eleonora Church in June 2016. The outfit she wore at the Royal Palace to meet a young girl with a debilitating disease as part of her role as patron of Min Stora Dag (similar to Make a Wish Foundation) in September 2016. 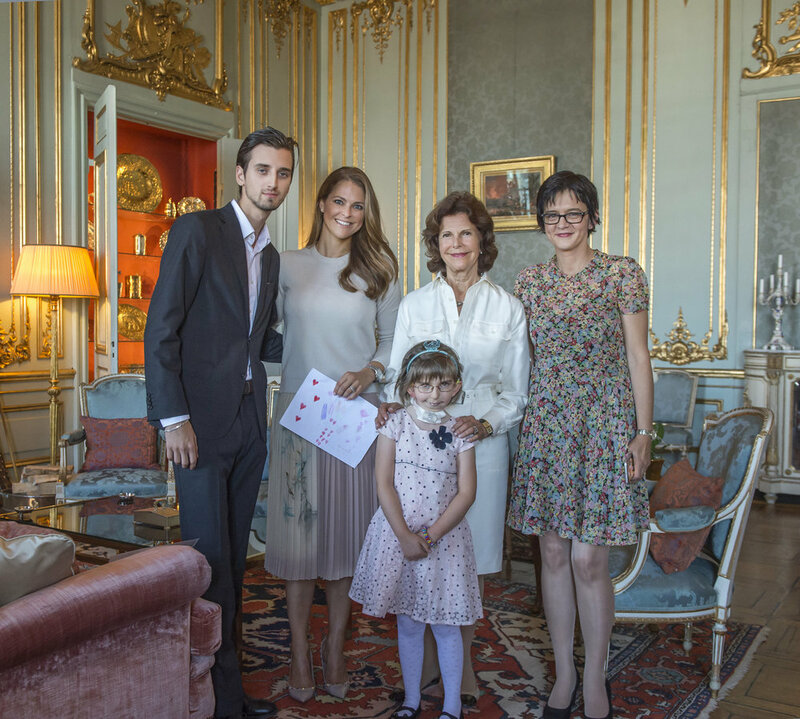 The little girl's dream was to meet Madeleine and Queen Silvia (who was also there). Madeleine wore a pink Valentino skirt, pink Valentino shoes, her Tai Initial Bracelet featuring an N, and her Cartier watch. The navy gown with embellishments around the waist by Laurel that she wore to the 70th birthday celebrations of King Harald of Norway in 2007. She wore it with her Fringe Tiara to the gala dinner when she was escorted in by then-Prince Philippe, Duke of Brabant. The one-shouldered Grecian grayish/white gown by Jenny Packham with sequins on the bodice. It's one of my favorites ever on her! Madeleine has worn it more than once. She wore it in September 2016 for the World Childhood Foundation USA Thank You Gala in New York. She carried a satin silver Marchesa clutch with it. She wore it for the first time in 2012 at an event with Chris O'Neill. Lastly, the Valentino gown worn on December 11, 2016, for the King's Dinner for the Nobel Laureates. She also wore a pair of matching Manolo Blahnik Hangisi Satin Pumps. For the 2015 Nobel events, Princess Madeleine wore a custom Fadi el Khoury creation for the Nobel Prize Ceremony and an Alberta Ferretti dress from the Pre-Fall 2015 collection for the King's dinner for the Nobel Laureates. The Nobel Prize Ceremony was first and took place on November 10, 2015, in Stockholm. Princess Madeleine wore a gorgeous grey custom Fadi el Khoury (one of my favorite gowns of hers ever). The gown, with a hint of glitter throughout, featured buttons down the front and sheer long sleeves. She wore her aunt, Princess Margaretha's Aquamarine Kokoshnik Tiara that perfectly matched her blue eyes. Madeleine carried a grey Jimmy Choo clutch and wore Queen Silvia’s diamond flower earrings and the aquamarine ring that Princess Lilian left her upon her death in 2013. 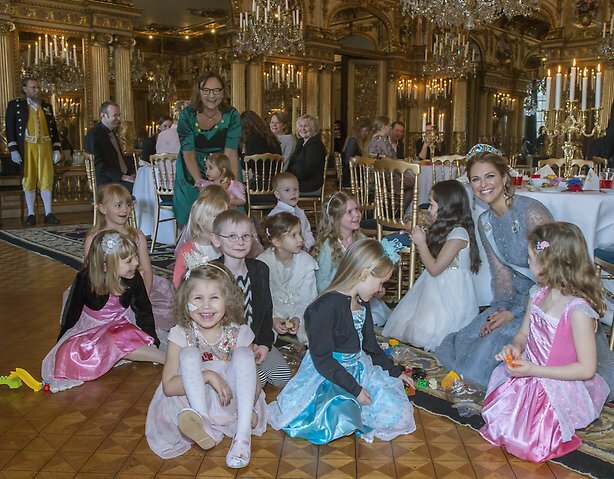 Note: This gown was worn in an official photo released by the Court and again (tiara and all) by Madeleine for a "fairytale tea party" at Stockholm Palace for children dealing with serious illnesses in coordination with her patronage Min Stora Dag (My Big Day) which is the Swedish version of the Make-a-Wish Foundation. Queen Silvia was in a red gown with the 9 Prong Tiara. Crown Princess Victoria wore a By Malina violet gown specially made Aubergine Silk Chiffon Gown and Cape while carrying a pink Bottega Veneta clutch. She wore the Connaught Tiara. Princess Sofia was in a navy Oscar de la Renta gown with a matching clutch. Sofia also wore her wedding tiara. 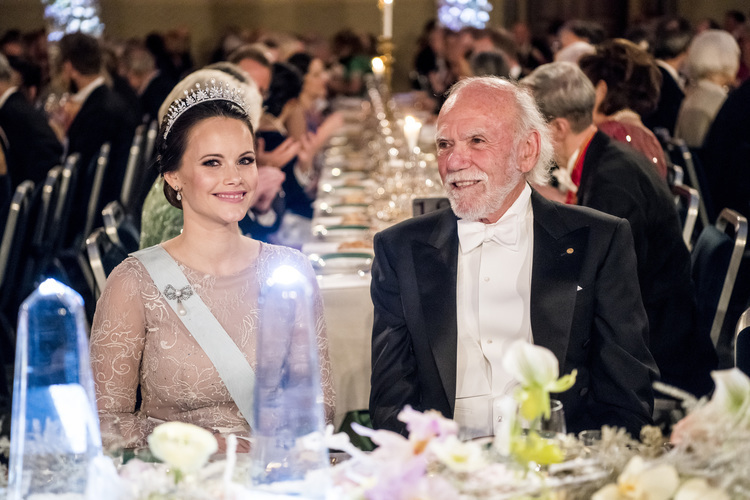 For the King's dinner for the Nobel Laureates at Stockholm Palace, Madeleine chose a dark grey Alberta Ferretti gown that featured a high collar and lace detailing. The Princess wore the Modern Fringe Tiara and carried a black Bottega Veneta clutch. Her mother was in a still to be identified gown; her sister was in a navy sequined Pär Engsheden gown that she had previously worn while pregnant with Princess Estelle in 2011. She wore the Baden Fringe Tiara and carried a dark Alexander McQueen clutch. Madeleine's sister-in-law was in a custom made couture dress from Zetterberg Couture which is slightly reminiscent of Madeleine's Nobel gown with the lace and button detailing. It would also be a gown she wore in an official photo. She was in her wedding tiara and carrying a Mango clutch. The awards were presented by King Carl XVI Gustaf in the Concert Hall. The banquet was held afterward at Stockholm City Hall. Nobel prizes are always handed out on December 10 - the day Alfred Nobel died - in his memory. Sarah found that Princess Madeleine wore a gorgeous floral Giambattista Valli dress to her father's birthday celebrations on April 30, 2016, and then re-wore it on Day One of the Canadian state visit to Sweden last month. For the state visit, the Princess was also wearing her Gianvito Rossi velvet pumps and was carrying a new black Valentino bag. The visit of the Governor General David Johnston and his wife, Dr. Sharon Johnston took place from February 20 through February 23. This was the first state visit Madeleine, and Chris, have taken part in for some time. For her father's 70th birthday celebrations last year, Madeleine wore the dress under a light pink Alexander McQueen coat. She was wearing a black hat with matching pink flower on top by Philip Treacy and black heels for the day. Madeleine also carried her black Bottega Veneta clutch. Royals from all over Europe flew in to Stockholm for His Majesty's 70th birthday celebrations which took place for several days. Princess Sofia only took part in the day activities as she had just given birth to Prince Alexander a week before the celebrations were due to take place. Princess Leonore and Prince Nicolas did not take part in any of the official events unlike their first cousins, Princess Estelle and one-month-old Prince Oscar. 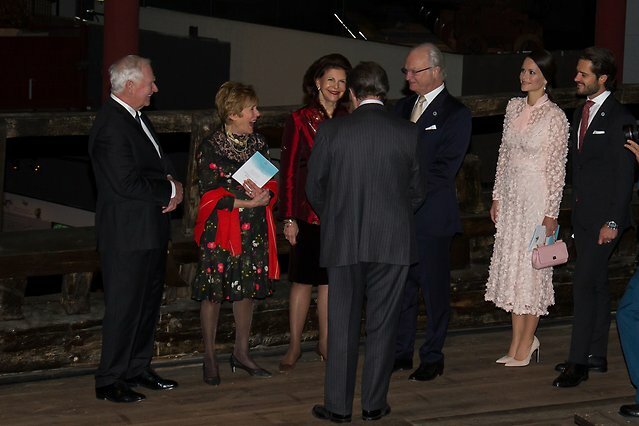 As one of my favorite royals, I couldn't wait to write about the id's we found of Princess Madeleine's outfit at the London Southbank Centre on Valentine's Day! Sarah found that Madeleine was in a new Vilshenko blouse. It was a combination of a cream blouse style and a pink one from the same designer. The blouse featured the short caped sleeves of the pink blouse with the design of the cream one. Madeleine wore her black Miu Miu boots, as well with a black pleated skirt by Valentino. Her Royal Highness also carried a new white clutch by the brand, SAVAS. Sarah goes into more detail about her outfit here. You can read more about her visit here from Royal Central. The Princess, who was on her first official engagement of 2017, looked thrilled to read with the children at the "Room for Children" at the London Southbank Centre that had just opened. The room has literature from all of the Nordic countries. The "Room for Children" was created by the Swedish Institute and the Kulturhuset/Stadsteatern Stockholm. The Poetry Library and Embassy of Sweden in London helped in the building of the room with the help of the Nordic Embassies and Representations in London, UK. Furthermore, IKEA and Swedish publishers were of assistance. The aim is to get children from ages 0 to 10 to read. The library will remain open throughout 2017. 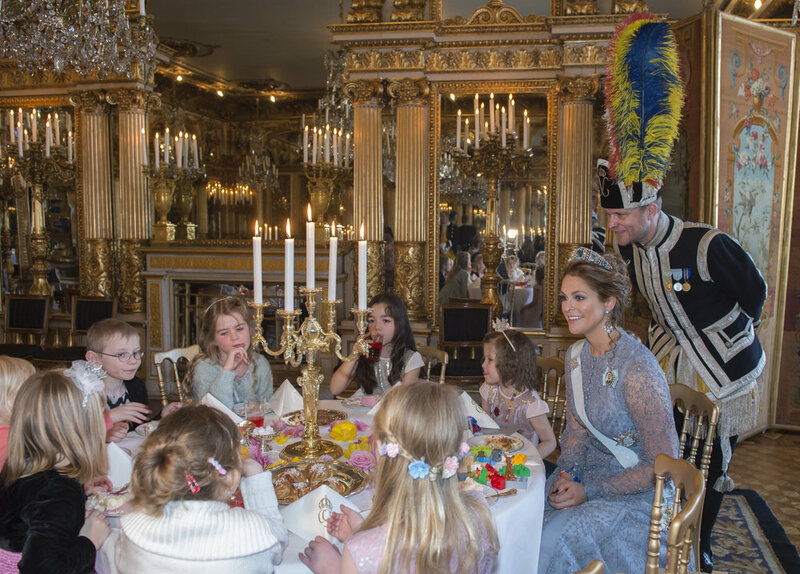 This was Princess Madeleine's first official engagement in London since moving there after the birth of Prince Nicolas in 2015. We are taking a look back to the 2016 summer photo session of the Swedish Royal Family at Solliden Palace. The session came as a surprise to most as it was not announced ahead of time. It took place the day after Crown Princess Victoria's birthday (b. July 14, 1977) on July 15. For the photocall, Sarah discovered that Madeleine wore a blue, sleeveless, high-necked, printed Valentino silk blouse. She accompanied it with wedges from Vince. Crown Princess Victoria wore a skirt from Swedish retailer H&M and wedges from Spanish clothing retailer Zara. For jewelry, she wore a gold Dulong Luna necklace and Dulong Kharisma earrings. Heaven and Laura found that the Crown Princess wore a top by Tiger of Sweden. Princess Sofia was in a blue top by Etolie Isabel Marant, according to Laura. She also wore a white version of her Castaner wedges that she had previously been seen in at Victoria's birthday celebrations. Sofia was also wearing her green Project Playground bracelet. Princess Estelle was pictured sitting in between her grandparents, while her mother held her baby brother, Prince Oscar. Princess Sofia held Prince Alexander, who seemed to be asleep for part of the session. Little Prince Nicolas, according to his mom, was quite tired and eventually began to cry. Princess Leonore was none too thrilled with the photo session. She wanted to run around and play causing her family to chase her down. She did finally pose for photos in her mother's arms. You can see these in the video from Expressen below. The Swedish Royal Family did not release any of the photos themselves outside of a collage they posted to their official Instagram. 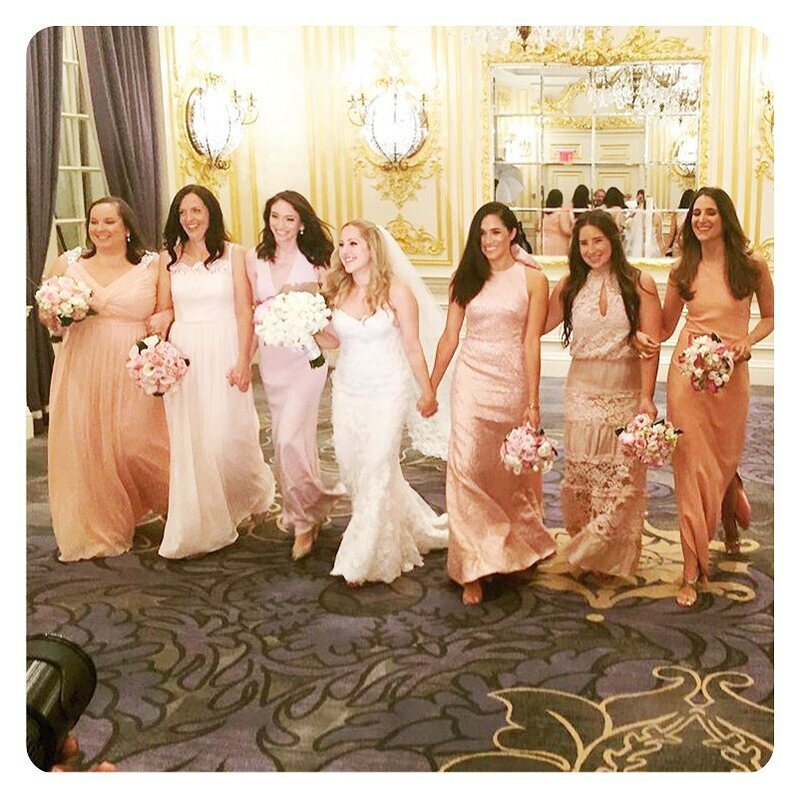 Sarah discovered that Princess Madeleine wore a beautiful light pink Elie Saab creation for her brother Prince Carl Philip's wedding to Sofia Hellqvist on June 13, 2015. Elie Saab is a favorite of the Swedish princesses. 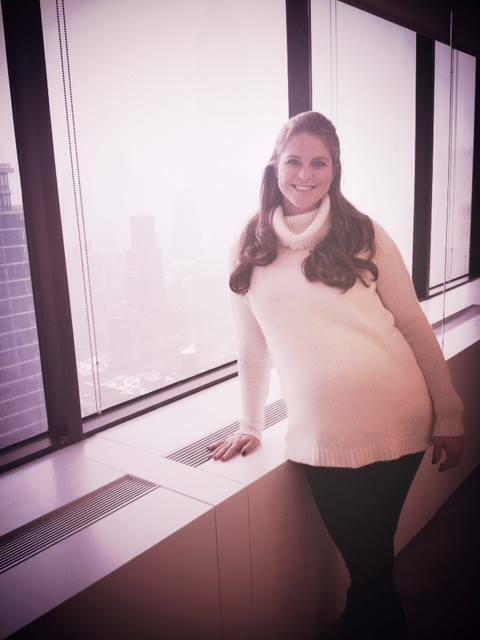 The dress was fitted to lay just right on her pregnant frame, and she looked gorgeous! She also wore the Modern Fringe Tiara, Vasa Earrings, and her Order of the Seraphim sash. 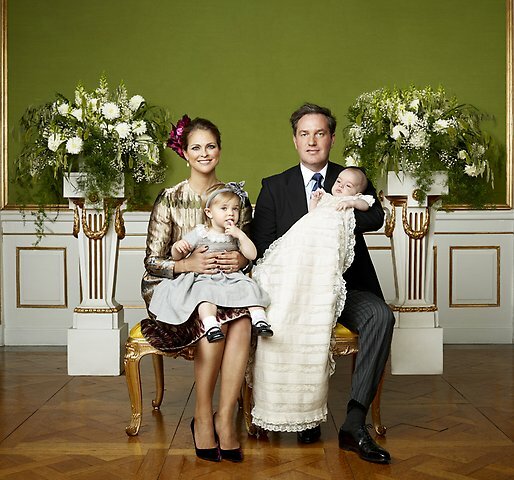 Notably, for the wedding, Madeleine was nine months pregnant with Prince Nicolas. She would give birth just two days after her brother. She arrived on the arm of her husband, Christopher O'Neill, who was carrying their one-year-old daughter, Princess Leonore. The wedding was broadcast live on SVT and was one to remember. The bride and groom exited the chapel while the choir sang an upbeat version of "Joyful, Joyful" that had the entire congregation dancing along. Young Princess Estelle was one of the bridesmaids, as well. 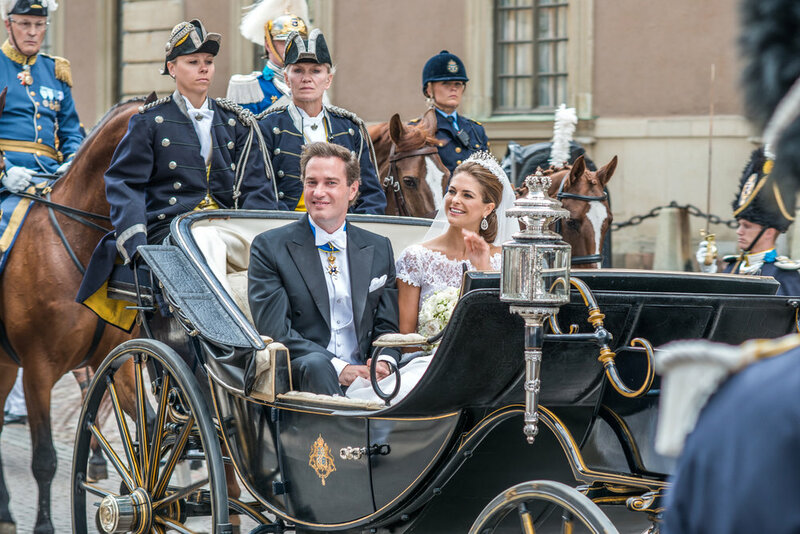 Royals from across the world traveled to Stockholm for the nuptials. 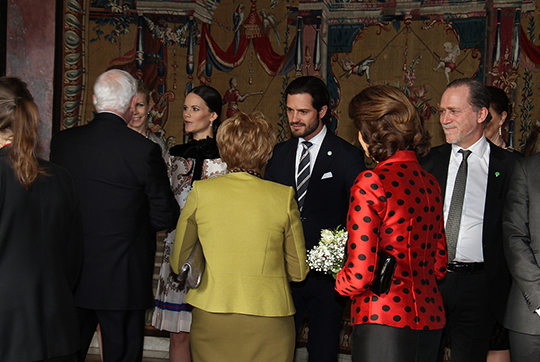 They included Queen Margrethe, the Crown Prince and Princess, Prince Joachim, and Princess Marie of Denmark. Margrethe and Carl Gustaf are first cousins, so it is no surprise that the entire family attended the wedding, with the exception of the Queen's husband, Prince Henrik. 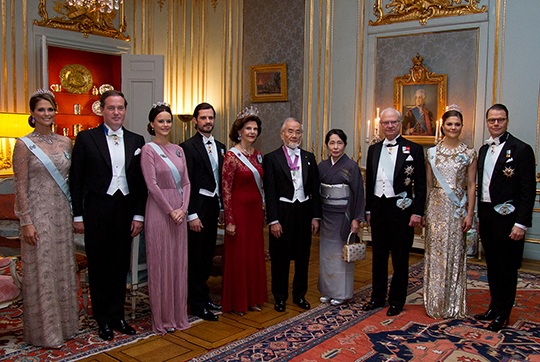 The Earl and Countess of Wessex, Queen Mathilde of Belgium, Prince Nikolaos and Princess Tatiana of Greece, Queen Maxima of the Netherlands, and Queen Sonja, Crown Prince Haakon, Crown Princess Mette-Marit, and Princess Martha Louise of Norway all attended, as well. Sarah found that Princess Madeleine wore a Roksanda dress to Prince Oscar's christening on May 27, 2016. Madeleine, carrying her eldest child Princess Leonore, entered the chapel with her cousin Oscar Magnuson (the son of Princess Christina) and Prince Daniel's cousin Hans Åström. Prince Oscar was christened in the Royal Chapel of Stockholm Palace. The ceremony was conducted by Archbishop Antje Jackelen. His godparents were his maternal aunt, Princess Madeleine; maternal 4th cousin and close friend, Crown Prince Frederik of Denmark; Crown Princess Mette-Marit of Norway; maternal cousin, Oscar Magnuson; and paternal cousin Hans Åström. The godparents. Photo: Anna-Lena Ahlström The Royal Court, Sweden. Crown Prince Frederik and Crown Princess Mette-Marit both delivered readings during the ceremony. Princess Madeleine helped her niece, Princess Estelle, pour the water for the christening into the christening font. Leonore appeared a bit jealous that her mother was holding her cousin Estelle, and so, Crown Princess Victoria stood up to hold her niece while the water was being poured. In one comical moment, little Leonore turned around in her chair while one of the soloists was singing. Unfortunately, she leaned a little too far back and knocked the chair and herself over. Oscar wore the traditional christening gown which was originally worn by Prince Gustaf Adolph (later King Gustaf VI Adolph) in 1906. His name and the date of his christening were sewn in to the gown, as per tradition. During the ceremony, Oscar was given his Order of the Seraphim sash by his grandfather, King Carl XVI Gustaf. However, he will not wear this again until he comes of age. Photo: Claudio Bresciani, TT/The Royal Court, Sweden. Oscar Carl Olof was born on March 2, 2016, at Karolinska University Hospital in Solna, Sweden. 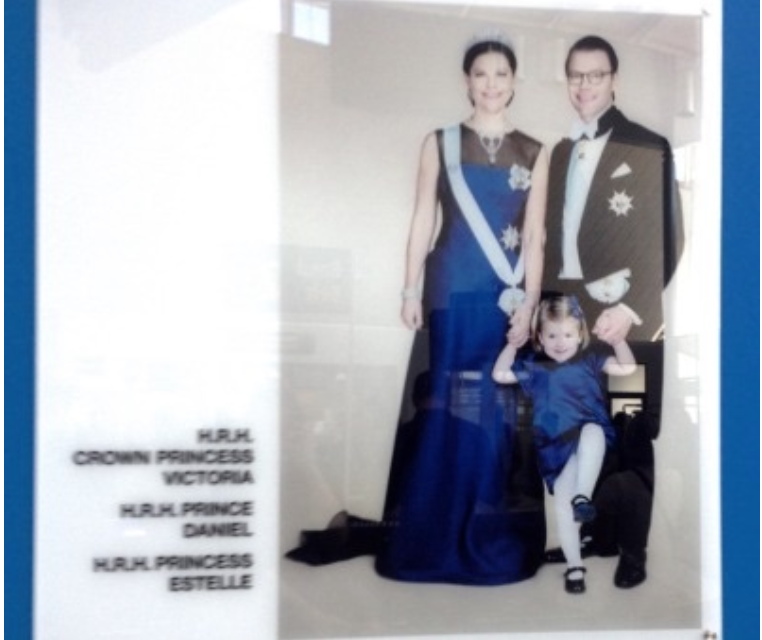 He has one older sister, Princess Estelle, who was born on February 23, 2012. After the ceremony, the happy family posed for photographers outside the chapel. Princess Estelle, when asked how the ceremony went, responded, "It went really well." Sarah found that Princess Madeleine wore an Erdem creation to Prince Alexander's christening on September 9, 2016. It features a white collar and blue themed floral design. She wore her hair up with a black bow and black heels. Prince Alexander was christened in the Royal Chapel at Drottningholm Palace. His godparents were his paternal aunt, Crown Princess Victoria; maternal aunt, Lina Frejd; paternal cousin (nephew of King Carl XVI Gustaf), Victor Magnuson; Carl Philip's friend, Jan-Ake Hansson; and Sofia's friend, Cajsa Larsson. Archbishop Antje Jackelen performed the ceremony, and "Twinkle, Twinkle, Little Star" was played. The little prince's grandfather, King Carl XVI Gustaf presented his youngest grandson with his Order of the Seraphim baby sash. He shook Alexander's hand, and, adorably, the little prince refused to let go of his grandfather's hand! He wore the same christening gown as his older cousins, which was first worn by Prince Gustaf Adolph in 1906. 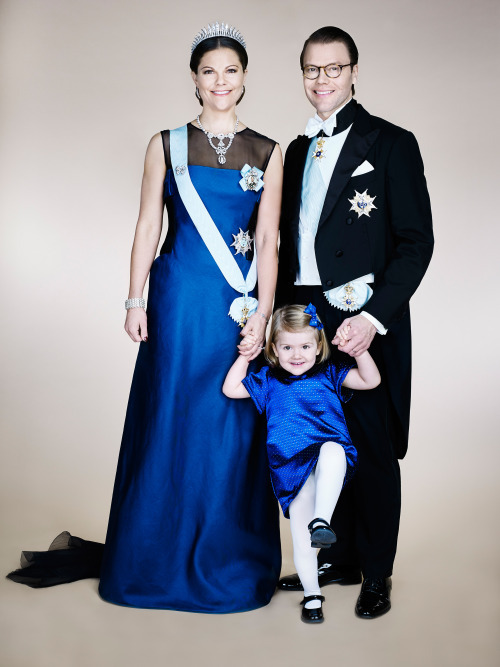 Prince Alexander, Duke of Sodermanland is fifth-in-line to the Swedish throne.